What is All-Star Medical about? All-Star Medical is dedicated to building relationships and trust with our customers to ensure satisfaction. We work to present every option we provide to assist with you or a loved one needs. Our devoted workers will show you various options of medical equipment or products that will help to maintain your every day accessibility. All-Star Medical is a retail only store, meaning we do not bill insurance. We are more than happy to help you with your insurance questions and will work to guide you in the correct direction. With All-Star Medical’s employees having an extensive background in the medical supply industry, we have the knowledge and equipment to help you find the right product to fulfill your needs. Let us help you! All Star Medical offers two locations in the middle Tennessee area including: Hermitage and Franklin. Our Hermitage, TN location was opened in August of 2009. This location is over 6,000 square foot and is the largest showroom in the middle Tennessee area. All Star’s Franklin, TN location was opened in November of 2013 to better serve the greater Nashville, TN area. Both of our locations include a wide variety of power recliners with lift assist, mobility scooters, power wheelchairs, wheelchair ramps, vehicle lifts, compression socks, daily living aids, bathroom safety products, hospital beds, and incontinence products. 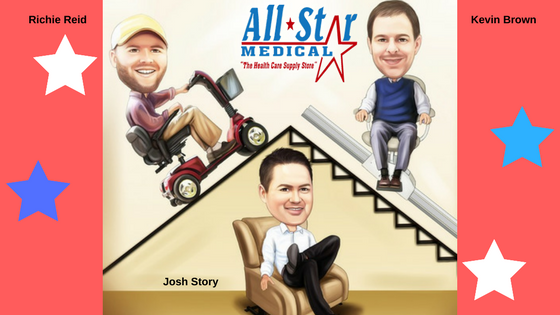 All Star Medical offers the only working stair lift display in the middle Tennessee area at both of our retail stores. In addition, we offer the largest Aluminum Wheelchair ramp display in the Southeast. All of our equipment presented on the floor is to benefit our customers throughout their purchasing process. Our display helps customers find the equipment or product that will best suite them. All Star offers a ‘Try Before You Buy’ program to allow customers to test the equipment they are interested in prior to purchasing. We also offer a short-term rental program including a variety of our medical supply. Click here to learn more. All-Star Medical's staff has over 54 years of experience in the medical equipment industry and has utilized that experience to construct the most efficient and service-oriented company possible. We strive to go the extra mile for each patient, patient's family, and caregivers. Helping you is our #1 goal! If we don't have the product you are looking for, we try our best to send you in the right direction to make your medical supply search as easy as possible. We pride ourselves on making our website, www.allstarmedicalllc.com, a place where you can go and feel comfortable to make that purchase of all the items you might need at the click of a button. We do our best to make our site informative and easy to move around in. We have a few different ways to purchase products on our site by use of a credit card or pay pal and we even have the ability to finance as you check out.. We are constantly adding products and running specials so if you don’t see what you are looking for, there is a good chance we can still get it for you at a competitive price. Give us a call today! Again, our Health Consultants would love to help you find what you are looking for. We are located just off of Lebanon rd on Central pike. You can't miss our sign and big green roof. We are located off of Cool Springs Blvd and in the same complex as Moe's Southwest Grill and McCalister's Deli.